Can San Francisco learn a thing or two from Portland, a city with a food cart scene that has flourished since the early 1990s? Ever since food carts in San Francisco started serving fresh coconut rice, spicy curry and vanilla bean crème brulée in 2008 on Linda Street and elsewhere, officials have talked about making legalization easier. Yet it still takes more than five city departments, thousands of dollars in permits and the permission of restaurants within two city blocks to make it into San Francisco’s food cart world. As a result, some food cart vendors have remained illegal, selling food on the streets without a permit, while others have been able to leverage the cart into a legitimate business. The Magic Curry Kart, for example, became a wholesaler of sauces and the Pizza Hacker now has a popular restaurant on Mission Street, south of Cesar Chavez. But in Portland, Multnomah County, which has 800 licensed mobile food units compared to 232 in San Francisco, the city has whittled down the process to a more straightforward and affordable endeavor. According to a recently published how-to manual from the Multnomah County Environmental Health Department, aspiring food cart vendors do not have to apply and pay for each multiple location that they intend to sell at. In San Francisco, they do. Moreover, the information to obtain a food cart license is more centralized, instead of spread out across several different regulatory agencies—each with its own processing fees—as it is in San Francisco. In San Francisco, multiple city departments handle food cart permits, including the Department of Public Health, the Department of Public Works, the Fire Department and the Planning Department. The bureaucratic layers often make the process more confusing for first-time food cart operators such as Koji Kanematsu, who had to submit more paperwork and pay additional money for each of his food cart locations, he said. He spent $1,000 to $2,000 to get a permit and nearly $15,000 to build his cart. Here, small entrepreneurs who want a food cart must apply for a $764 Peddler and Pushcart permit through the Department of Public Works, file a $341 application with the Department of Public Health, pay inspection fees of up to $701.50 and if the cart has an open flame, hand over $674 to the San Francisco Fire Department. The total for permits: $2,480, and that is before the cost of the cart. One that meets the city’s standards costs approximately $5,000, according to Imelda Reyes, senior inspector for the mobile food facility program at the Department of Public Health. In Portland, it costs $830 and takes a few weeks for a full-fledged mobile food unit license. Lizzy Canton, the founder of the blog Food Carts Portland, cites “flexible zoning” as the key to Portland’s bustling street food scene. Accessible and easy-to-navigate food cart laws are the main reasons Portland has so much success in street eats, she explained. Likewise, Brett Burmeister, the current owner of Food Carts Portland, believes that Portland can be a model for other cities. Its famous food carts sell everything from reindeer sausage to kimchi quesadillas. They roam the city without many bureaucratic hurdles to jump over, he said. While Portland has a freewheeling mobility, San Francisco’s rules make getting a permit difficult. According to current regulations, for example, food carts in San Francisco are not allowed within 200 feet from the next closest mobile vendor or brick-and-mortar restaurant. They also cannot be 600 feet, or two blocks, within other businesses selling “the same type of food.” However, this definition is unclear and has been interpreted to mean anything from grocery stores selling similar products to corner shops selling everyday pre-packaged foods. This confusion has caused disputes between food carts and brick-and-mortar restaurants that see them as unfair competition. According to Rahul Shah, a junior engineer at the Department of Public Works in charge of issuing the permits, many of the proposed food cart locations encroach on the territory of existing businesses who can object to any proposed food cart location and stall the application process. Last year, Supervisor Scott Wiener passed legislation that helped simplify the application process for food truck operators by creating a compromise between food trucks and already established brick-and-mortar restaurants. The legislation consolidated the number of departments that food truck operators have to go through and loosened the rule that prevented food trucks from operating within 1,500 feet of middle and high schools. However, the legislation did not affect those hoping to start a mobile food venture via pushcart. Andres Powers, a legislative aide, added that although the supervisor’s office is “always open to take on issues that there’s a desire to have addressed,” there simply has not been enough clamor around reforming food cart licensing in San Francisco. 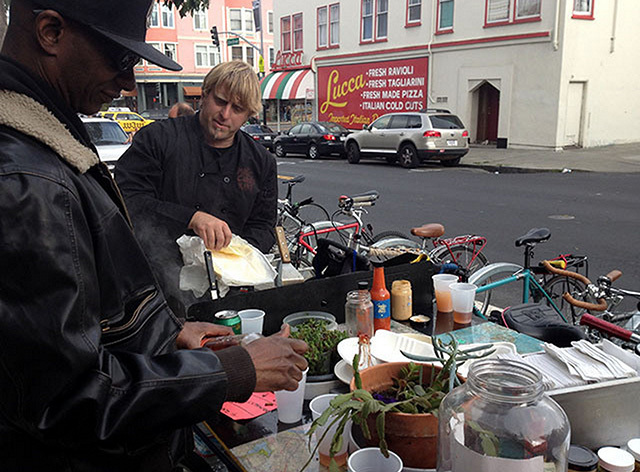 “The program that we have in San Francisco is a good program that has support from broad constituencies in terms of the food truck operators as well as neighborhood groups and local merchants, so at this point, we would not look into modeling our program after Portland, particularly given that we went through a long process with a lot of folks to come up with a proposal that is now in the books,” Powers said. As the senior program manager at La Cocina, a nonprofit incubator kitchen that helps low-income immigrants launch food businesses, Geetika Agrawal views food carts as a “latent opportunity for the city” to nurture a more lively street food scene in San Francisco and provide more opportunities for small, start-up food businesses. But the city’s various zoning restrictions still stand in the way. The pushback that mobile vendors receive from nearby brick-and-mortar restaurants “adds a layer of complexity” to the process, explains Agrawal, who grew up and traveled within India’s and Southeast Asia’s thriving street food cultures. “If you don’t have versatility in what you sell out of it and don’t have a versatile amount of locations at which you can sell food out of your cart, then it all just becomes less valuable,” Agrawal said. In Portland, the boom in food carts led to a working group in 1997 that created a specific set of guidelines for the maverick mobile vendors that popped up along Portland’s major thoroughfares. Before, they abided by strict rules designed for restaurants. Now, Portland has become a leader in mobile eats through the city’s more hands-off approach. Agrawal of La Cocina said that in an easier world, she could see small-time entrepreneurs setting up shop and selling food virtually anywhere on San Francisco’s streets. She dreams of a “versatile, mobile delivery system” that would allow first-time food cart vendors to follow customers and easily expand their clientele. Holy crap, a pro capitalism and anti regulation article from mission local? Am I on the correct website? Thank you very much for pointing out the insane mess a business must go through to just open their doors. This is a microcosm of all business in SF. You have to be rich or have friends in the city to start a business here. The small mom and pop has little to no chance with all the regulations/fees this city puts on business. Bravo Mission Local! Are you for dropping health inspections of food trucks, too? How adventurous! Streamlining the process for legalizing street vendors is one of the best ways the city could encourage job creation and stimulate entrepreneurship, even in hard times, and make the streets safer to walk at night, by encouraging civic life. But restaurants have paid so much to operate legally in San Francisco, they’ll be damned if the city makes it easy for food carts to compete with them for lower overhead. The first one to call the cops on street vendor? Probably a restaurant owner across the street. The self-employed vendor has the power to be their own boss and make more money per hour than restaurants pay their cooks. The restauranteur thrives on cheap labor and wants to suppress wages so they can keep their investors and bankers happy. If cooks were empowered to work for themselves as vendors, restaurants would have to raise wages for cooks, because they’d be in competition with better wages. Think about who profits from the current food regulatory system. Firstly, the city. Secondly, almost no one. Lastly, restaurants. Who loses? Almost everyone who cooks your food, which includes a lot of people. Lowering barriers to self-employment is a good thing for the local economy. Even if you aren’t the kind of person who cares about the living conditions of your fellow human beings and how they survive, or don’t, on meager wages, perhaps a cold argument in favor of more equitable market conditions will move you to support creating favorable conditions for micro-entrepreneurship.